The Ferrosi Collection is one of the classic and most popular lines from Outdoor Research. 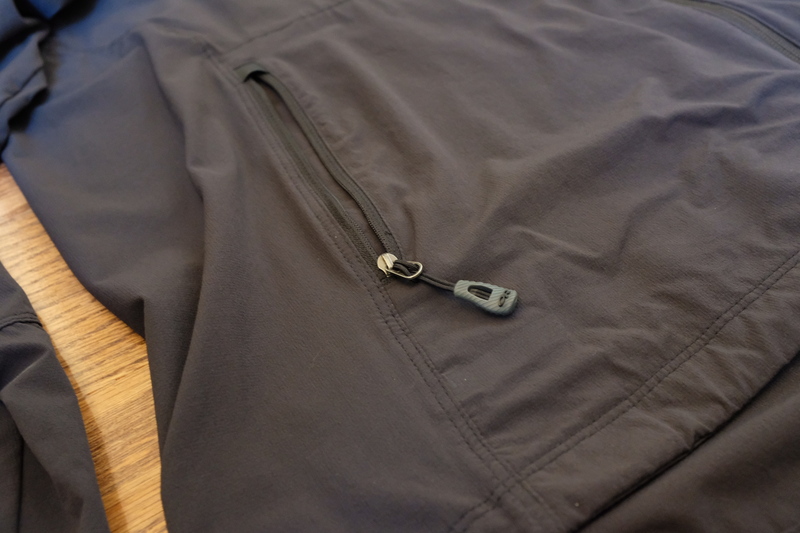 I’ve owned the Ferrosi Jacket for a few years now and it is still my go to lightweight soft shell jacket (note that the latest version has a few cosmetic changes like thumb holes and a slightly different chest pocket). 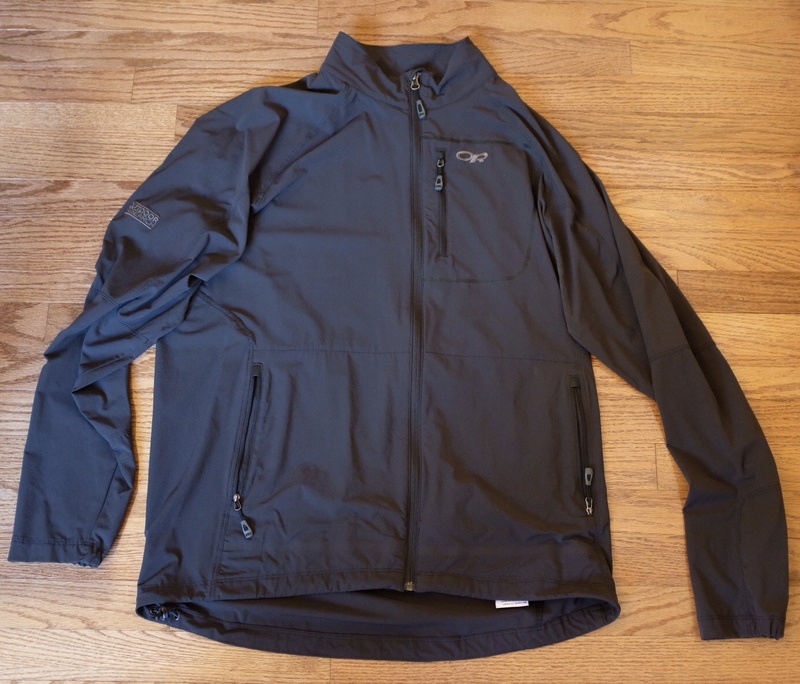 This jacket is made of Outdoor Research’s Ferrosi fabric, a 90D stretch woven ripstop nylon (86% nylon, 14% spandex). 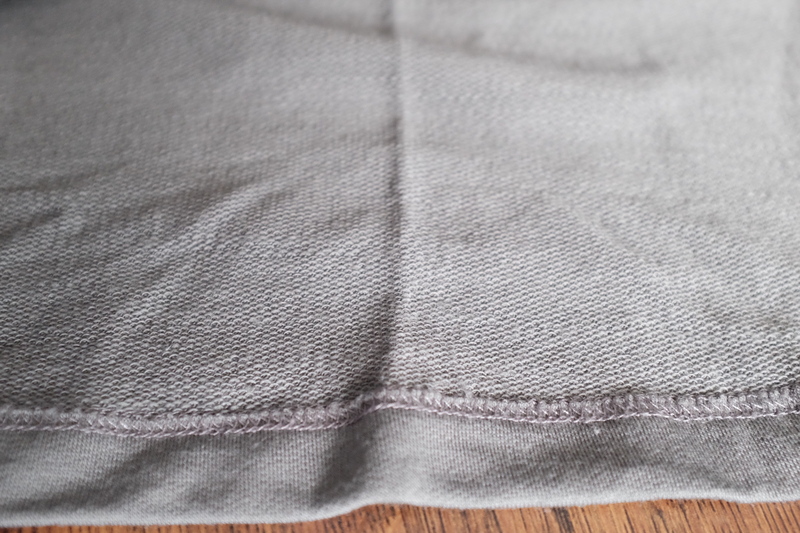 While it is a thin fabric, it has a heavy drape and is breathable and quick-drying. Another great attribute is that it has a matte texture finish, so it isn’t the typical technical shiny. 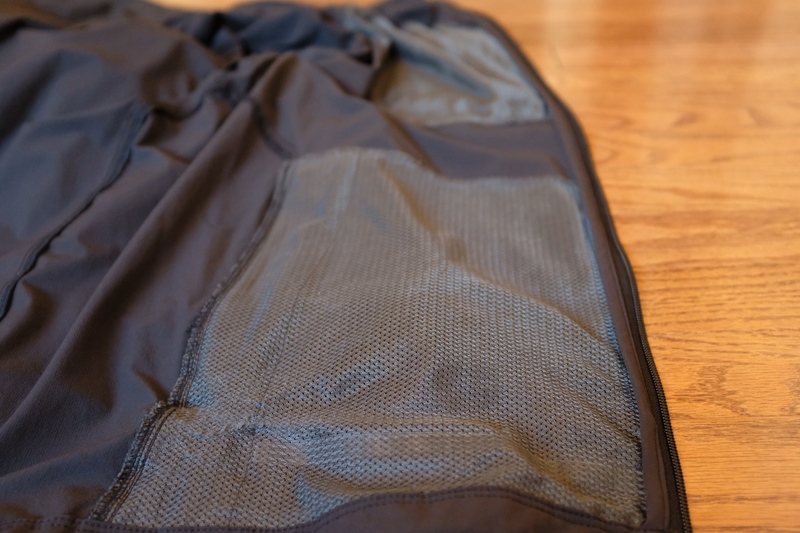 This jacket is able to shed a light rain, and when it does get wet it dries quickly. However, this fabric is not the most comfortable when it is wet as the stretch just makes it feel droopy. In addition to being water resistant, there is some wind resistance as well. 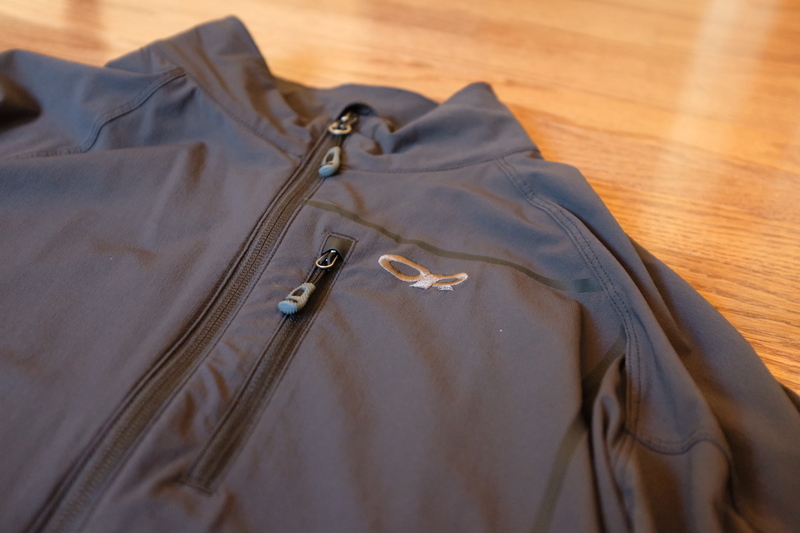 However, breathability and wind resistance are always a tradeoff, and this jacket prioritizes breathability. Other than in the rain, I have been very happy with the performance of this jacket. It is able to keep me comfortable down to about 45 °F, any colder and I need a fleece underneath to keep warm. When it gets really cold, it’s a nice durable layer for over my down jacket. The two hand pockets and chest pocket are very well sized and placed, which is not something that can be said for all lightweight jackets. The linings of the pockets are mesh, which is nice for ventilation. The left hand pocket doubles as a stuff sack, but I find it packs smaller by rolling (down to about the size of a burrito). This jacket is very durable. 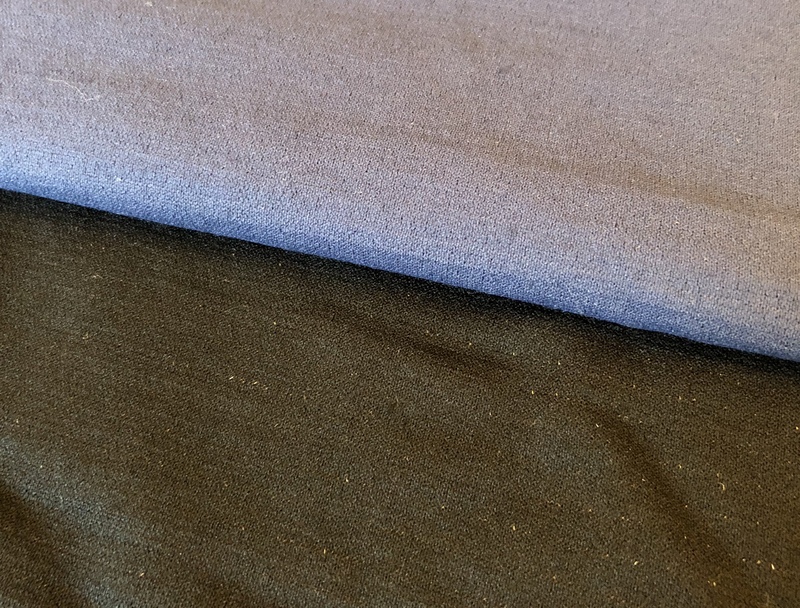 I’ve had no issues with the face fabric (unlike my Ferrosi Pants, which have a few snags) and the only pilling I can find is on the mesh pockets on the inside. The zippers are sturdy and operate smoothly from day one. I think this jacket will last a long while. Since the Ferrosi Collection is designed for climbing, the jacket has an athletic slim fit while still leaving some room for layering. It has a nice length and the 1/4 elastic cuffs and drawstring bottom help keep it in place when active or in the wind. 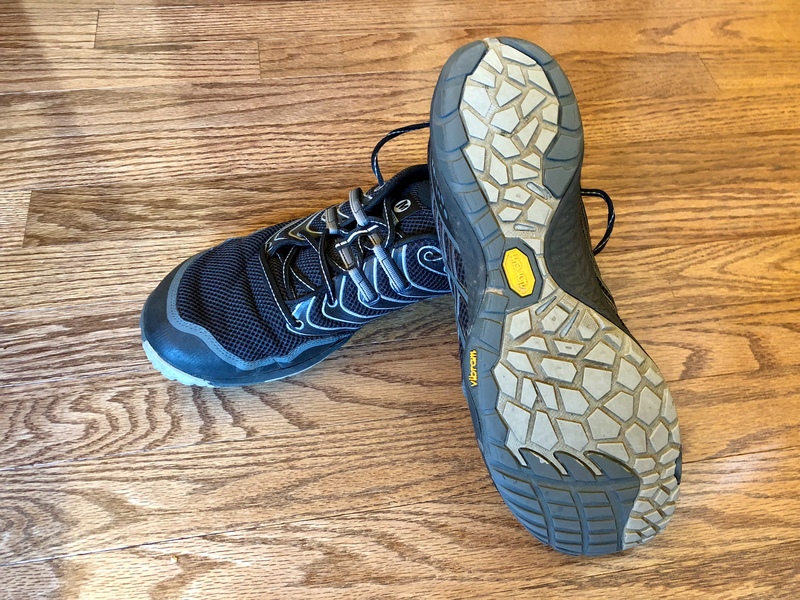 To me it fits true to size with the size chart and what you’d expect from your sizing in other Outdoor Research gear (typically a size larger than Patagonia). Especially for the price, this jacket certainly should be one to consider if you are looking for a light soft shell for fall or spring. The breathability keeps you comfortable when the afternoons get warm, while the water resistance will shed a light rain. However, If it’s going to be a cool windy day or rainy, you might want to look to something like the Outdoor Research Helium II Jacket. We’ve just updated our recommendations in all of our guides. Be sure to check out our newest favorites for activewear, business, and travel. The Porter Hoodie is an athletic take on a 100% merino wool hoodie. I’ve been testing this hoodie for almost two years now, and it still looks brand new. With that in mind, let’s take a look at it. 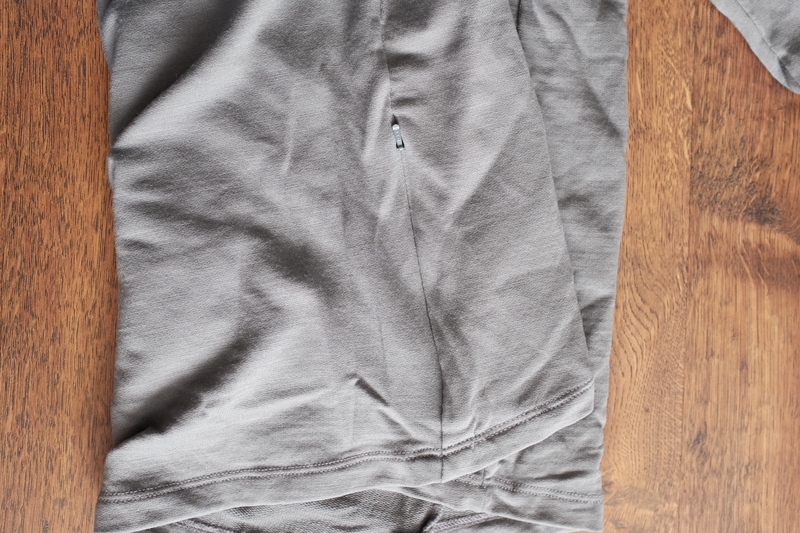 This is a 100% merino hoodie, but the fabric itself is what OLIVERS calls “merino luxe terry”. If you’ve worn terry cloth before, I think that name accurately describes this hoodie. As the outer face is smooth and looks clean, while the inner face has a distinct waffle pattern. Unlike cotton hoodies, there is no soft or plush interior. OLIVERS doesn’t specify a weight for the fabric, but I would peg it somewhere around 220 gsm. It’s light for a hoodie but heavier than some of my other merino garments. Overall this is not a soft merino, but it feels closer to a merino nylon blend. This gives it the durable feeling that you want in a garment of this type. I like to think of this as a mid-layer. It’s perfect for a cool evening, a quick warm up layer, or a hoodie to wear around the house. It’s a layer, not something you likely will throw on to stay warm in the deep of winter. This makes it much more versatile than the other (heavier) hoodies I have. With a heavier hoodie, I often start to overheat indoors and find it harder to layer when it is very cold out. I think the best application is for this to be an indoor hoodie, or an active layer when the weather is colder outside. Overall, I find it to be a great weight and very comfortable to wear. 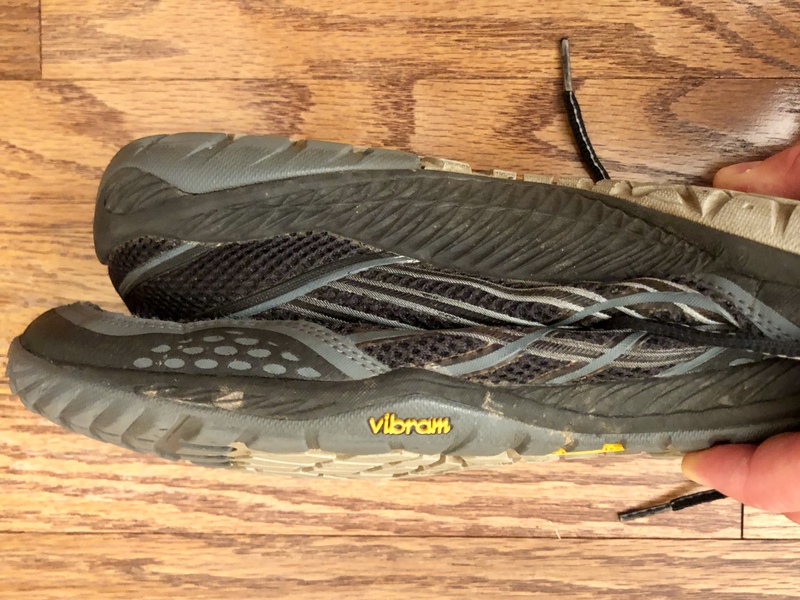 It’s not often that we can comment on the long term durability of the items we review here, but since I’ve been testing this since November of 2016 I can in this case. After almost 2 years of wear and washing, the hoodie looks brand new. I can’t find anything to indicate this amount of wear. It’s not the most worn garment I own, but it certainly has been used quite a lot and I would have expected more evidence of wear. It is a very durable garment. 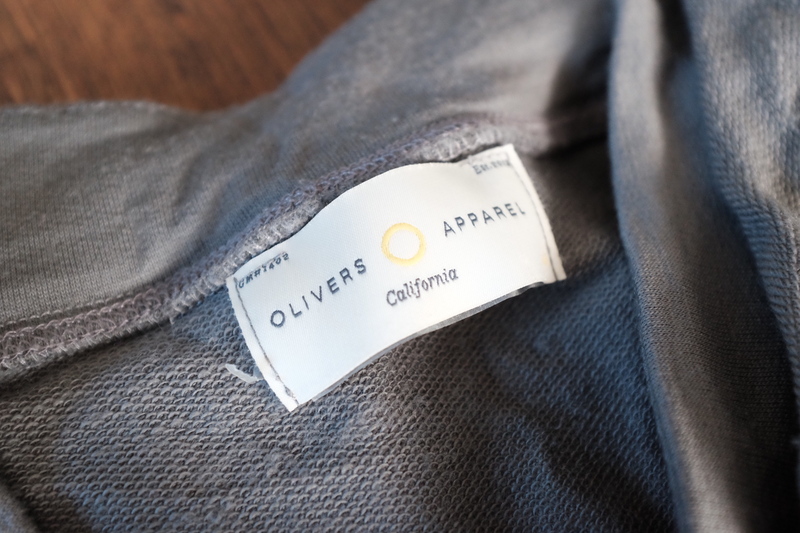 OLIVERS describes the fit of this hoodie as athletic and it is spot on. The sleeves are narrow and the body is wider through the chest with a definite taper leading down to the waist. You can combat this by sizing up, or enjoy a trim hoodie as designed. One thing to note about the fit, is that the athletic fit means you might find it more difficult to wear over certain looser fitting t-shirts. 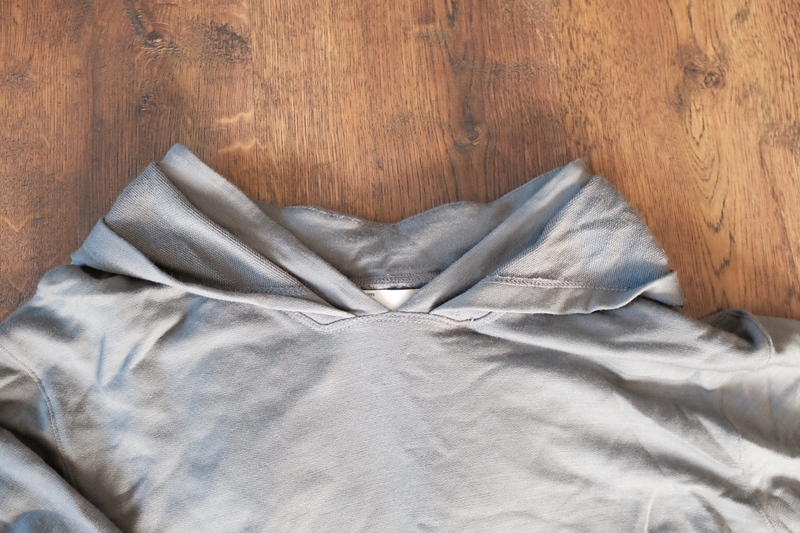 I have never had an issue where I couldn’t layer it, but I do often have to adjust the sleeves of a t-shirt to not appear lumpy. The fit works well for me, but its not the normal boxy look of a hoodie. 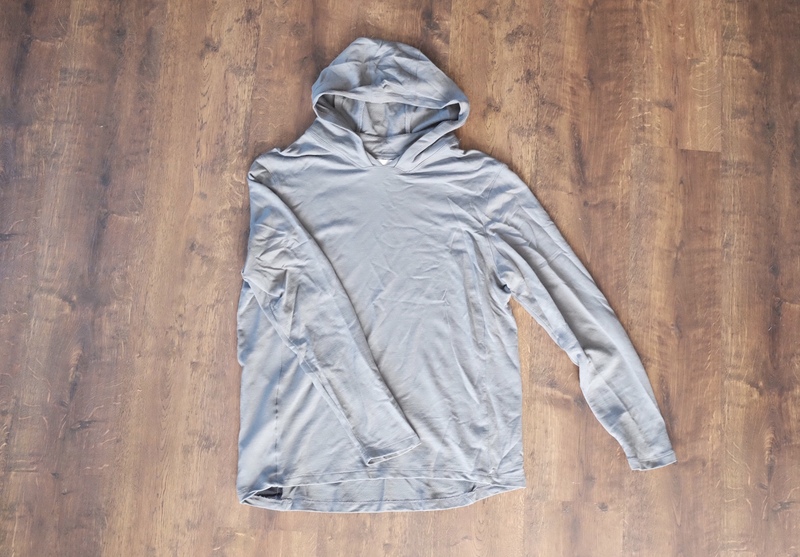 Other elements of this hoodie, like the lack of a front pocket, the hidden side pocket, and the collar inside the hood itself lead to a really smart look. It’s a bit of an enigma for me, as it fits right in as an athletic/workout hoodie but can be made to look nicerwith the right pairing of pants. I liked this hoodie when I first got it, and I still like it to this day. It finds itself being worn a lot when the weather cools off and packed as a just in case layer when I head out in the summer months. If you are ok with the fit, then it’s a great merino hoodie with all of the merino wool properties we love. Mizzen+Main has been around for a while, specializing in men’s synthetic dress and casual collared shirts. While they have branched out like many of the established brands, their shirts remain their specialty. 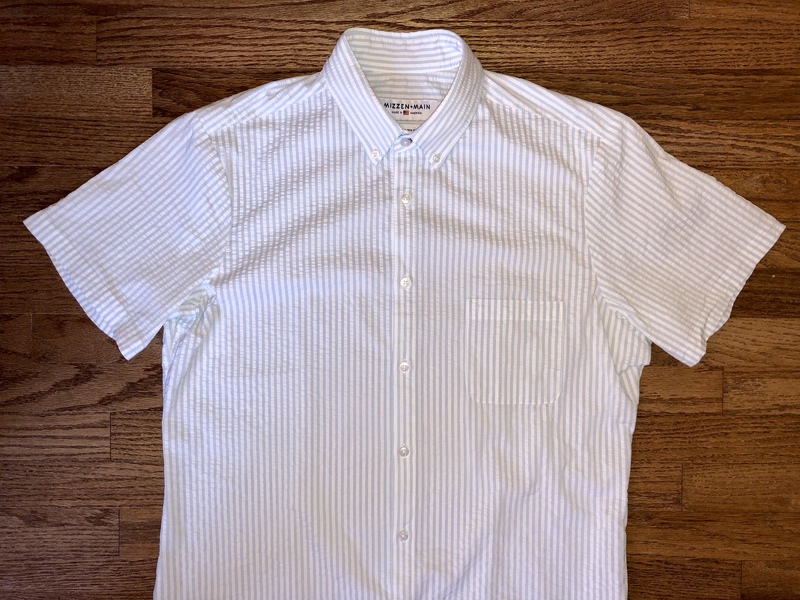 As part of our search for great short sleeve summer shirts, I got the opportunity to give the Mizzen+Main Hartley, a short sleeve seersucker button down shirt, a try. You’ve probably think of seersucker in a summer suit, but it can be used in other garments as well. Traditional seersucker is 100% cotton with a bumpy texture that comes from how the threads are woven. The texture of the fabric helps keep it away from the skin, helping with air circulation. While not as airy (or wrinkly) as linen, seersucker is an age-old solution for a summer fabric. Mizzen+Main took an updated approach to seersucker for the fabric on this shirt. While retaining the bumpy texture and traditional stripe pattern, they made the fabric with 68% cotton, 27% polyester for moisture wicking, and 5% spandex for two-way stretch. Overall, the fabric looks and feels like cotton with the hidden benefit of stretch for a little extra movement. One advantage of Mizzen+Main products is that they come in a variety of cuts (standard, trim, and trim tall). I found the XL Trim to work well for me across the chest, but the sleeves were a bit larger in diameter than I usually like in a short sleeve shirt and the length was a bit long to look neat while untucked. Since the XL Trim works well for me in the long sleeve shirts, I imagine the sleeve size is just the nature of the cut of this shirt. The combination of the bumpy texture and polyester content of the fabric makes this shirt always look presentable right out of the wash (cold & hang dry). While the wrinkles from the package did not fall out on their own, I have never had to worry about wrinkles after the first wash. I gave this shirt a run for it’s money over the last few weeks with the hot and humid weather we’ve been having (90 °F+) and I must say I was pretty impressed. Having high cotton content, I did not expect to like this shirt. I found the seersucker to work as advertised — it felt airy since it was held away from my skin. The polyester kept the shirt from feeling damp, although I could still feel sweat between my skin and the shirt. My guess is that the shirt was just not absorbing as much sweat due to the texture. As far as odor resistance, I was also surprised to be able to wear this shirt a second day after airing it out overnight. I started to notice some sweat stains around the collar and under the arms before any smell (the sweat stains easily wash out). While it will never perform like a merino or 100% synthetic shirt, it looked normal while keeping me cool and more comfortable than a traditional cotton shirt. While the shirt isn’t my style, I was pleasantly surprised with it’s performance. It definitely wore better than the 68% cotton content would suggest. I’m not sure that I would pay the $110 retail price, but if you like the looks and find it for the right price it makes for a decent summer shirt. 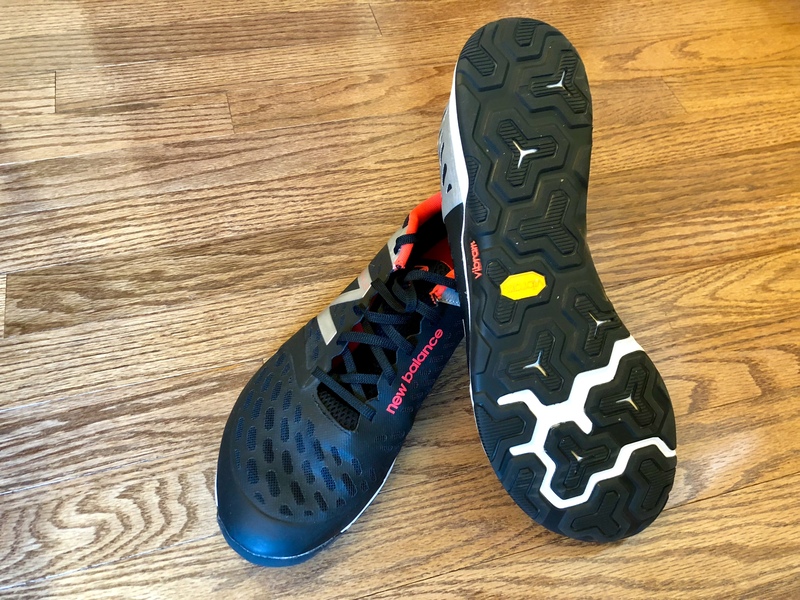 The item in this review was provided for review purposes by Y Athletics. Just about five years ago, Y Athletics launched their synthetic SilverAir Crew Neck on Kickstarter. 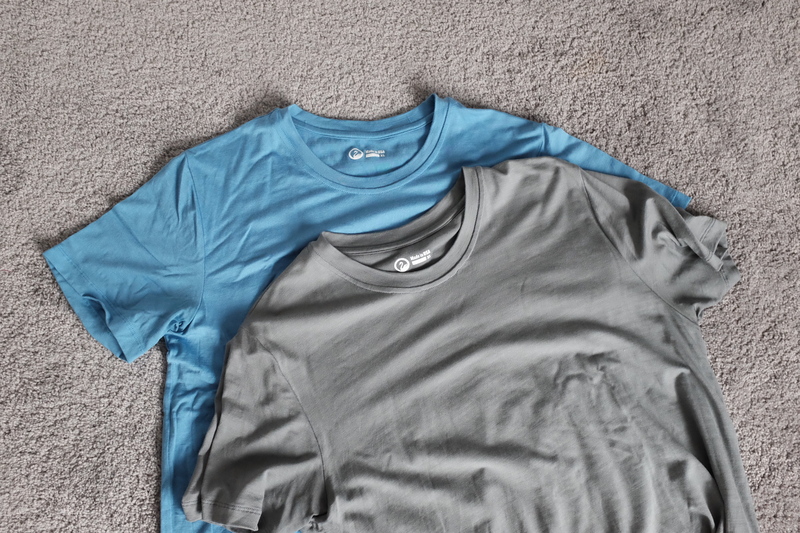 We reviewed the shirt and were won over by the comfort and odor resistance. Just this week, they launched the next generation SilverAir shirt — the SilverAir Merino T-Shirt. I’ve been testing a prototype of the shirt since May and the production version for about two weeks. I think this shirt is going to be a game changer for not just the workout shirt market but the t-shirt market as a whole. Y Athletics designed the double sided SilverAir Merino fabric specifically for this shirt. The inside is 17.5 micron merino wool with pure silver threads running throughout, while the outside is plated with nylon. This gives the best of both worlds without the sacrifice of a blend — odor, thermal, and moisture control on the inside with excellent drape, hand feel, and durability on the outside. The knit is extremely open (without any issues of being see-thru) to allow for airflow making for a very lightweight shirt. I’ve worn this shirt as both a workout and an everyday shirt, and it has outperformed any other shirt I own. The seamless construction of the body eliminates many potential areas for chafing. 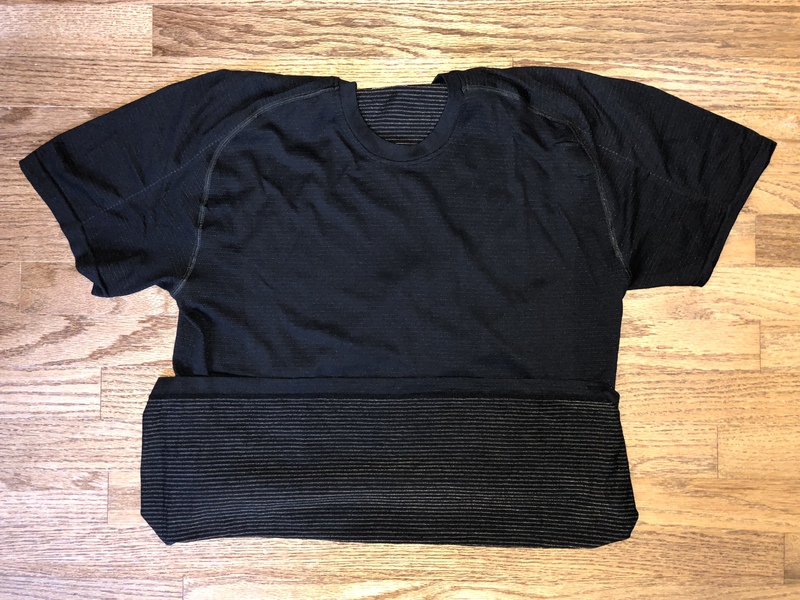 The sleeves are raglan style (for range of motion and comfort) and attached with flatlock stitching — no chafing there either. After the fabric, the next most impressive feature of the shirt is the hidden mesh ventilation panels running under the arms and down the sides of the shirt. Just like the synthetic shirt, the mesh in no way makes those areas of the shirt see through. The panels are all but invisible on the black shirt and are just slightly noticeable on the blue (and I imagine the grey as well). This is due to the merino and the nylon taking dye differently. Comparison of the ventilation panels on the blue and black shirts. This shirt resists odors just like a 100% merino shirt. It’s the first time I’ve had a non-100% merino shirt that needs to be washed because it looks dirty rather than because it smells. The combination of being 100% merino with silver threads on the inside makes it act like a full merino shirt in the odor department. The other benefit of the silver threads is that they won’t wash out like the silver treatments used on other clothing. As far as moisture management, this shirt excels as compared to a 100% merino or merino blend shirt. Nothing will feel as light in an intense and sweaty workout as a synthetic shirt, but the thinness of the merino layer here makes all the difference. 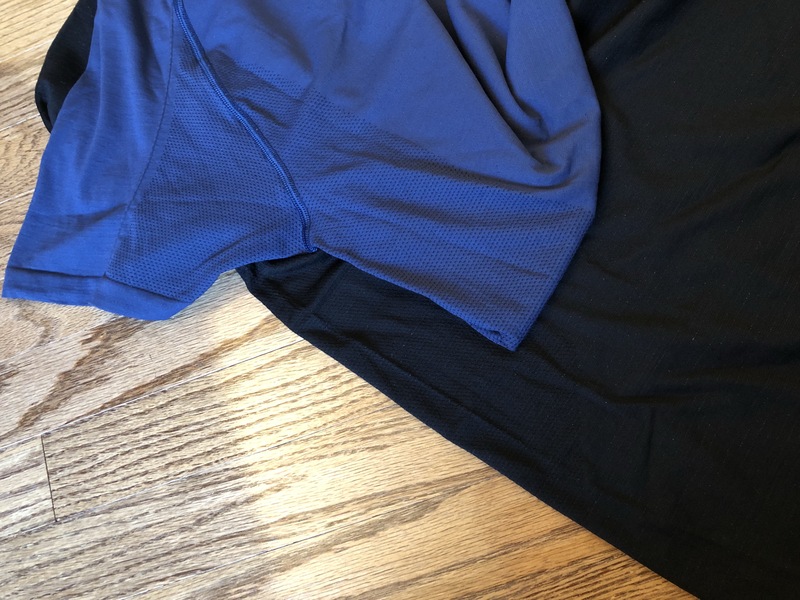 Since merino works by absorbing moisture into the fiber versus polyester and nylon repelling the moisture, a merino shirt tends to get more weighted down by sweat during a workout. 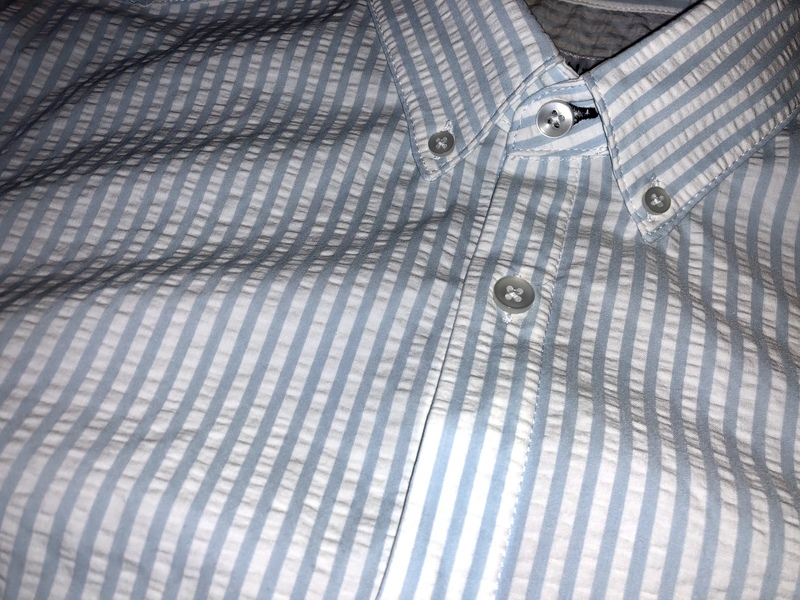 The nylon plating also imparts great durability to this shirt. I have not seen any indications of pilling (which I’ve seen pretty quickly on the armpits of some merino shirts from working out). I wouldn’t hesitate to wear this shirt for rucking or travel with a backpack. The design of this shirt allows for universal wear — it can go from the gym to the weekend. Compared to the original SilverAir shirt, the fit is a little closer to the body and the collar closer to the neck giving it a more tailored and polished look. The drape and handfeel are also excellent. It wears like a cotton t-shirt, it blends in. When I first heard about the nylon face, I expected at least some nylon sheen, but the finish is actually very matte. The team definitely worked hard on this as I even saw improvement between the prototype and production versions. There is just one caveat with the black color — the silver threads show through just a little bit (again the team was able to improve this between the prototype and production versions). While some may not even notice or not care, this is worth mentioning if you are trying to choose a color and want to be able to wear the shirt in many situations. While the color does not show correctly on the blue, this is an accurate comparison of how the silver thread shows through the black but not the blue shirt. The SilverAir Merino T-Shirt is a huge upgrade from the original synthetic version. It has become my most worn workout and all-around t-shirt. With excellent odor resistance and drape it fits in almost anywhere. 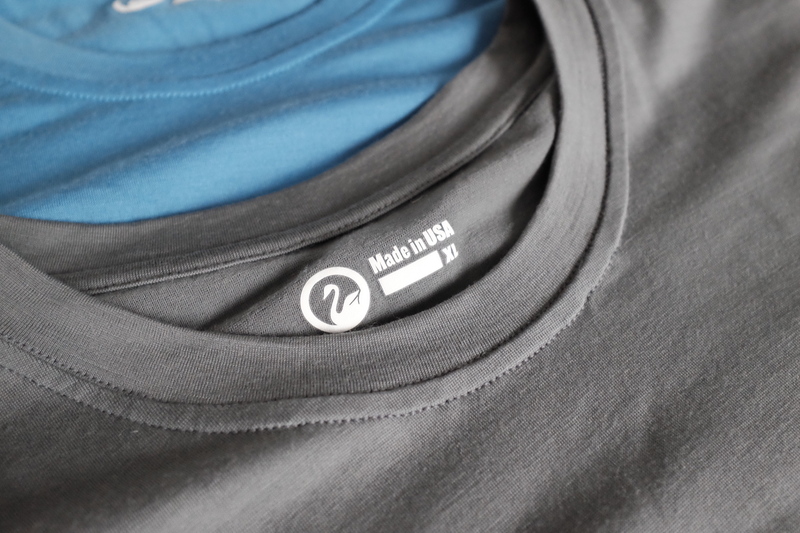 If you’ve been thinking about merino but are worried about the durability, this is your shirt. There are no tradeoffs on merino performance to gain durability. The Kickstarter runs through September 6th, and at $49 the shirt is a steal. Even at the retail price of $69, this shirt represents a great value and is set to make waves in the industry.